Functional, natural sports cosmetics to bring you joy from exercise, improve your performance, and make your day-to-day life more pleasant. It doesn't matter if you're a professional or an amateur, whether you race or simply train for pleasure. Whether you're racing, training, or out cycling with friends, it's always necessary to make sure your body temperature is right, to give it the energy it needs to ensure you'll be able to enjoy every moment you're on the move. Start Emulsion ENERGY preparation for sporting activity. It acts as an energy tonic with a long effect. It contains a unique mixture of essential oils Tarchoplus, guarana, juniper, eukalyptus and clove essences, vitamins and Green tea extract which improves local blood supply, acts as antioxidant and stimulates better sporting performance. Rub into skin 15–20 minutes before performance. Protect skin that sweats under your sports clothes or shoes by rubbing in STAY COOL protective cream. 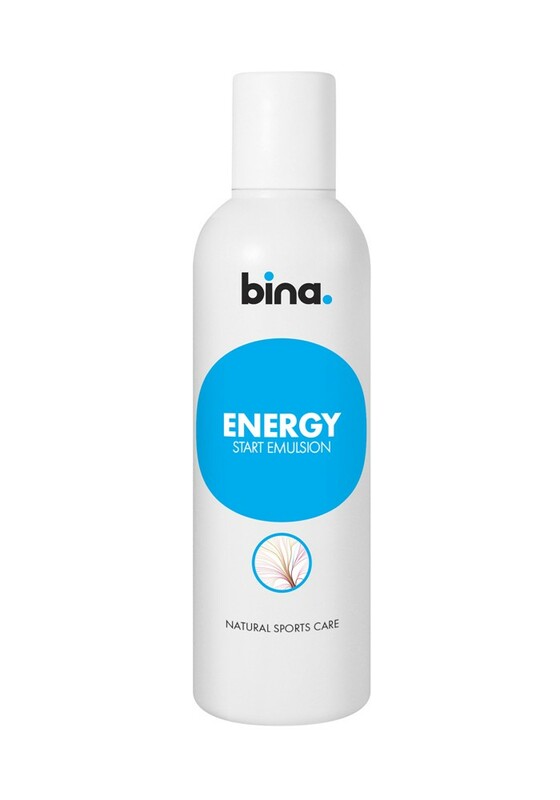 After doing sport, we recommend using our refreshing shower gel FRESH and recovery emulsion BACK TO GAME from the BINA sports cosmetics collection. It does not damage sportswear. It does not contain any doping substances. Store at a temperature of 5-25 °C. Ingredients: Aqua, Paraffinum Liquidum, Glyceryl Stearate, Cetearyl Alcohol, Glycerin, Ceteareth-20, Ceteareth-12, Cetyl Palmitate, Carbomer, Paullinia Cupana Extract, Camellia Sinensis Leaf Extract, Propylene Glycol, Juniperus Communis Fruit Oil, Eucalyptus Globulus Leaf Oil, Eugenia Caryophyllus Leaf Oil, Dicaprylyl Ether, Tarchonanthus Camphoratus Oil, 4-Terpineol, Helichyrusm Angustifolium Flower Extract, Polyacrylamide, C13-14 Isoparaffin, Laureth-7, Phenoxyethanol, Ethylhexylglycerine, Triethanolamine, D-Limonene, Eugenol.